Scott and Kelly are Americans who live near Bamberg and gave us this short report of their excursion in the Bamberg countryside. Bamberg is proud to have ten popular breweries within its city limits, but what about those lesser-known breweries in the outlying areas? My wife Kelley and I decided to uncover the delights of some of the some of the smaller, but no less interesting breweries within a 15-20 kilometer radius of Bamberg. We started out our bier-tasting journey not far from our own home in Kemmern at the Brauerei Hümmer located in Breitengüssbach. Since the weather was in our favor that day, we decided to enjoy the small biergarten they have in between the braurei and the gasthaus. On this particular visit, I tried the "Urtyp." This was served in a krug and was sweet smelling, with a sweet wheat-flavored taste. Kelley sampled the Pils which had a darker-than-usual color. It was also a bit heavier than your typical pilsner. After observing the locals celebrate with multiple beers and approving of our own choices, we decided Brauerei Hümmer is definitely worth a trip to Breitengussbach. Next stop...Drosendorf's Brauerei Göller, located just past the larger town of Memmelsdorf. The atmosphere of the gasthaus is always pleasant and Herr Göller has proven he can throw one heck of a party. He recently held a Bock Bier Fest with a D.J. for music and dancing outside and a traditional Bavarian band for entertainment on the inside. 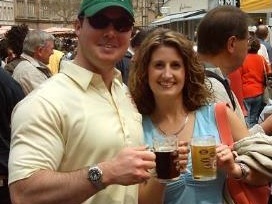 On the day we visited I ordered an Unser Urstoff and Kelley got the Lager. The Urstoff had a cloudy, amber color with a mild, smooth flavor, but rather insignificant. The Lager was lighter than most lagers, with a slightly bitter aftertaste. After much deliberation we agreed that the Lager was the better choice. 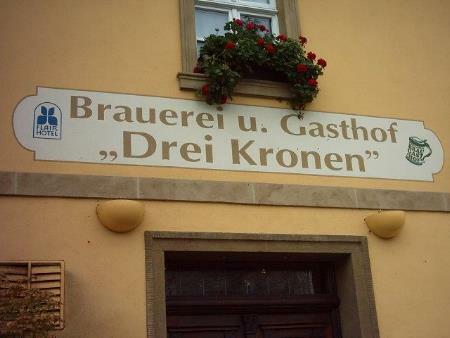 On the way back toward Bamberg we stopped at Memmelsdorf's Brauerei Drei Kronen. We have one thing to say - keep on driving. 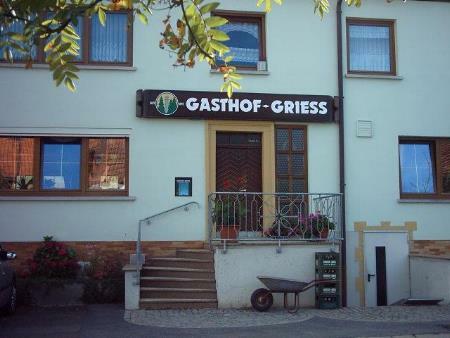 Although the gasthaus is very nicely decorated, it doesn't make up for the horrible tasting beer. It was downright awful. The Pils came in a fancy glass, but one sip of it was enough to give you "bitter beer face" for the rest of the day. The lager wasn't any better. It has a strong nutty taste to it. Needless to say, we weren't even able to finish one beer. 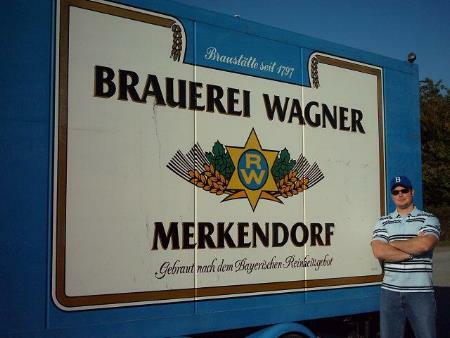 A little further out in the village of Merkendorf is Brauerei Wagner. This is a Brauerei Gasthaus with a large biergarten in the back. The brewery is on the premises just across from the restaurant. Inside the atmosphere was a comfortable, traditional German gasthaus. I tried the Lager and Kelley had a Radler. The lager was surprisingly tangy with a slight fruity taste. Kelley assured me the Radler was a refreshing break from the full-strength pilsners from earlier in the day. We were only there for drinks, but the delicious aromas of home-cooked foods were very tempting and convinced us we'll have to make a trip back to Merkendorf for dinner. The last brewery for this segment is definitely the least. After a long bike ride out to Geisfeld, we stopped in at Brauerei Griess. The weather was beautiful, but unfortunately the keller has already been closed for the season. I tasted the lager and was not impressed. It was very bitter. This wasn't worth the bike ride out there. This article was originally published in 2004. This completely agrees with our experience of Griess in September 2013. In spite of all the many good reports, we found that the beer in keller was flat and had a difficult to define bitterness. It was simply awful and was probably a cask left over from the previous day. Unfortunately, the beer in the Stube was not much better. Although it was not flat, it had the difficult to pin down metallic bitterness - quite unpleasant. On top of this, the guy serving, who I believe is the owner, was most unfriendly and we couldn't leave quickly enough. A bottle tasted some days after in Abseits was a little better although still retaining that metallic taste. HI! My family has a microbrewery in Eltman-Eschenbach with Eschenbacher Bier. I've been to the brewery before, and I'm going to Germany in a few weeks but dont have time to make it there again. Do you know of any places in Bamberg that sell from the local breweries? I'm trying to get a few bottles to bring back with me. Which number is highest 17 or 34?